Barbecue Grill Smokers and Wood Chip Trays allow you to add unique smoke flavor to your grilled foods. Different woods such as hickory, apple wood and mesquite will provide different flavors so experimenting is key. 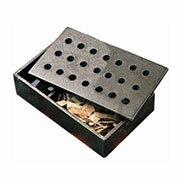 Grill Spot offers the largest selection of Barbecue Grill smokers and wood chip trays in Canada. If you can't find a part or accessory, just contact our friendly customer care team. We're here to help!